If you’re embarrassed about missing teeth, a dental implant can restore the appearance and health of your smile. This tooth replacement method has become extremely popular because implants look, feel, and function just like natural teeth. See if this treatment is right for you. 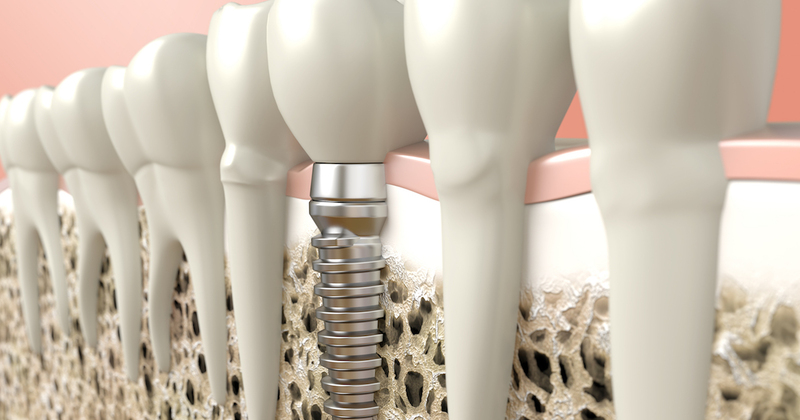 A dental implant gets surgically embedded in the jawbone, which connects to a dental crown that takes the place of the missing tooth. Since it fuses to the jawbone over time, a dental implant is completely secure, very comfortable, and closely resembles your natural tooth. In comparison, other tooth replacement options are either uncomfortable, prone to breaking, or must be regularly replaced. Even though dental crowns secured to implants cost more than those other options, their strength, security, and beauty make the cost of dental implants well worth it. You will need to visit either a specialist called a prosthodontist or a general dentist who has training in tooth replacement. The dentist will perform a dental examination to determine if dental implants are right for you. Keep in mind that the time frame for completing the implant and crown procedures is based on many factors, from your dental health to the amount of jawbone you have. If you don’t have enough bone, you will need to have bone grafting to build up the natural bone, which will take additional time and increase the cost of dental implants. If you have a sufficient amount of jawbone, you will have lower dental implant costs and the procedure can start whenever you’re ready. With the traditional method of dental implant placement, the complete implant process will usually take a few months. But if mini implants or another technique called same day dental implants are chosen, you can actually get same day dental implants and see immediate results. Believe it or not, caring for dental implants is the same as for natural teeth. Just practice good dental habits at home, such as daily brushing and flossing, and get regular check-ups and cleanings from your general dentist.